Learn about enterprise and entrepreneurship in a global context from some of the leading entrepreneurship and management experts. Whether your ambition is to start your own business venture or bring fresh thinking to existing companies, this masters course will give you the skills and knowledge that are essential to help you succeed. You’ll learn about the core principles of innovation and entrepreneurship in a global context, with an emphasis on contemporary topics such as the digital and sharing economy. The course also includes a specialist module on social enterprise and Entrepreneurship not offered by most UK business schools. Modules on entrepreneurship, innovation and management draw on established, relevant theoretical and practical approaches and are underpinned by our academics’ research. You’ll learn through practical exercises, talks from leading entrepreneurs and visits to innovative businesses, and benefit from our academics’ unrivalled expertise in areas including the digital economy and social and sustainable enterprise. Innovation is crucial to the survival and growth of companies across all sectors, so your entrepreneurial abilities will open up a wealth of career options in many different types of organisation. You’ll gain an in-depth understanding of key aspects of enterprise and innovation in a global context, and you’ll be encouraged to think in innovative ways about business challenges. There is a focus throughout the modules on contemporary topics such as the digital and sharing economy, entrepreneurial growth of high-tech ventures, and sustainable and social enterprise. These are areas supported by significant research expertise within the Business School. This course attracts students from around the world. Some have recently completed their undergraduate studies, while others have some work experience and are looking to gain new skills that will help them get their own business off the ground or bring new approaches within their chosen sector. The relatively small but diverse student group on this MSc means students receive plenty of support and attention from their tutors, while their learning is enriched by the different cultural perspectives within the group. This is a full-time course taught over one year. During the year you’ll take a mix of compulsory and optional modules and complete a dissertation. A module on social enterprise and entrepreneurship that is not offered on most UK masters courses in this field. It was designed in response to demand from students interested in setting up businesses for social good, particularly in developing countries. You’ll learn about social enterprise business models, with input from guest speakers from local social enterprises and charities as well as site visits to their organisations. The Enterprise, Entrepreneurship and New Business Venturing module, which will equip you with the knowledge to start your own enterprise or change the trajectory of an existing business using entrepreneurial techniques. It takes a hands-on approach to learning, giving you the opportunity to develop your own ideas, practise your pitching skills and gain valuable feedback from peers and academics. The optional modules will enable you to broaden your managerial capabilities in areas such as HR management, operations management or finance, providing a firm foundation whatever your chosen career path. The dissertation is another opportunity to follow your interests and pursue your entrepreneurial goals. With guidance from your supervisor, you’ll have the freedom to choose your own topic, which could be practice-based – for example you could conduct a feasibility study to inform the launch of your own business. You’ll learn from academics who are active researchers within the Business School and the affiliated Centre for Inclusive and Sustainable Entrepreneurship and Innovation. This enables them to bring the latest research insights to their teaching. We have particular expertise in a number of areas, including entrepreneurship, digital business models, business innovation and growth, and social, environmental and economic sustainability issues in entrepreneurship and innovation. Programme leader Dr Pelin Demirel is also a specialist in issues related to digital entrepreneurship and small high-tech companies. Dr Vadim Grinevich is one of the UK’s leading researchers in the digital and sharing economy and has led projects on upscaling in the sharing economy and business-to-business sharing economy models. His studies enable him to bring emerging concepts and real-world examples to his teaching and he has links with a network of digital entrepreneurs who give guest lectures for our students. Dr Stratos Ramoglou’s recent work on entrepreneurial opportunities in today’s business world has been published in the highly prestigious Academy of Management Journal. Professor Mine Karatas-Ozkan’s research focuses on the social and diversity aspects of entrepreneurship. She has published several books and numerous research papers on these themes. Professor Laura Costanzo’s interests include social and sustainable entrepreneurship, with a focus on the UK context. Her studies, which are underpinned by a strategic and management perspective, also include a focus on the management of teams for decision making. Dr Shahnaz Ibrahim specialises in corporate social responsibility, with a focus on developing and emerging economies. Dr Pawan Tamvada is interested in self-employment and the growth of entrepreneurial businesses in different sectors in various countries. His research also looks into how entrepreneurship delivers welfare for the society. Our academics are in close contact with businesses through their research, which often involves working with companies’ datasets and interviewing professionals. For example they have strong links with large retailers such as Amazon and Sainsbury’s and global players such as Rolls-Royce, 3M and Tom Cridland. During the modules your tutors will use case studies that enable you to explore innovation and enterprise issues in real companies, and you’ll have the opportunity to visit some of the companies featured in the case studies. For example, on a recent visit to London-based company Benihana, students talked to senior staff about how they managed and grew this international enterprise. Many modules also include guest lectures from successful entrepreneurs and you’ll benefit from regular industry talks run by the department. As well as enriching your learning, these visits and lectures provide an opportunity to expand your professional networks. We are keen to create opportunities outside the course that enable our students to broaden their experience, develop their skills and enhance their CVs. These might include workshops focusing on innovation and entrepreneurship, held in the UK or overseas. We also run competitions in collaboration with industry, such as a recent programme with Boeing that challenged students to come up with innovative ways to run aspects of its business. 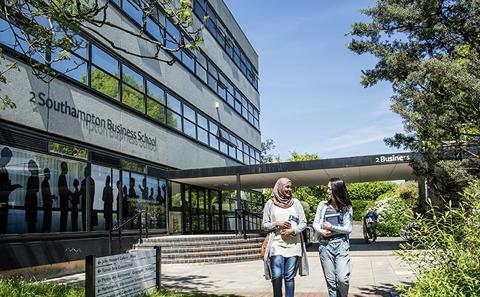 If your ambition is to turn a business idea into a successful enterprise, or to bring innovative ways of working to a family business, you’ll be able to take advantage of the Southampton Business School’s Small Business Clinic. Run by staff from the Business School and the University’s Law School, with input from local businesses, it offers training and the opportunity to work with a mentor from industry to test out your ideas and receive expert feedback and advice. Learn to set up and grow your own business venture or work innovatively within established companies to improve their performance. You’ll be exposed to current research and the latest ideas in entrepreneurship, innovation and management. Integrates digital and sharing economy and sustainability issues, drawing from the Business School’s renowned research expertise in these fields. Includes a module on social enterprise, a rapidly growing movement that is attracting increasing attention from international organisations, public bodies and entrepreneurial firms. Learn through guest lectures from successful innovators, entrepreneurs and business leaders, as well as site visits to entrepreneurial companies. Take advantage of a range of additional opportunities to enhance your skills, such as the Small Business Clinic, workshops and competitions run jointly with industry. You must choose ONE Option module totalling 15 CATS/7.5 ECTS in Semester 2. All Option modules are offered subject to availability and timetabling constraints. This degree will equip you for a career with a focus on entrepreneurship or management. You may choose to start your own business venture or take over the running of a family firm. Or your skills will be sought after by any business that is interested in finding new ways of doing things, including new start-ups, third sector organisations or large, well-established companies. One graduate has started a business focused on environmental sustainability in the UK. Another has set up a think tank in his home country, bringing together representatives from government and academia to create opportunities for entrepreneurs. One of our alumni works for BDO, a prestigious accountancy and business advisory firm. You’ll learn through a combination of lectures, seminars and private study. Our lecturers use a range of interactive methods such as group work, case studies and practical exercises to help you develop subject-specific knowledge but also transferable skills, such as critical and analytical thinking, teamwork, pitching and presentation skills. Each module is assessed individually. A variety of methods are used in order to assess a range of different skills; these include exams, group presentations, and both group and individual assignments. The relatively small class size on this course means we can build strong relationships with our students, whom we see as associates in our learning environment. You’ll become a member of a vibrant department, invited to seminars and other events of interest within the Business School. You’ll have a personal academic adviser who can provide support and advice on course-related matters, as well as plenty of opportunities to discuss your work with module tutors. You will also have the opportunity to work closely with your dissertation supervisor, who can help bring your entrepreneurial ideas to fruition.